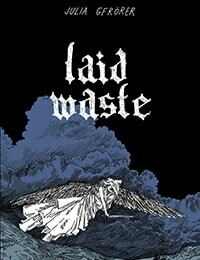 Laid Waste Average 0.00/5 - out of 0 total votes. In a plague-ravaged medieval city, survival is a harsher fate than death. As corpses accumulate around her, Agnes, a young widow possessed of supernatural strength, must weigh her obligations to the dead and dying against her desire to protect what little remains.Laid Waste is a graphic novella about love and kindness among vermin in the putrid miasma at the end of the world. As with her evocative debut book, Black is the Color, Julia Gfrörer's delicate, gothic drawing style perfectly complements the period era of the book's setting, bringing the lyricism and romanticism of her prose to the fore.